All transactions are safe and secure with a reliable history in online purchasing behind each of our associates. 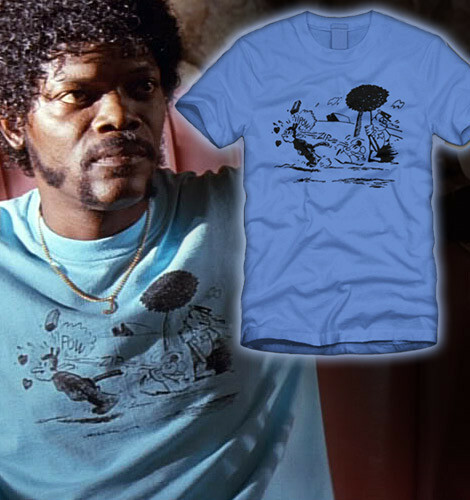 Buy the Jules' Blue Krazy Kat Cartoon t-shirt to own Pulp Fiction clothing and merchandise. Pulp Fiction t-shirts are in high demand, especially this light blue Krazy Kat Cartoon tee Jules wore at the coffee shop. According to Jimmie, who originally owned the garment himself, he looks like a dork. I guess Samuel L. Jackson doesn't know how to rock the look but I'm sure that you do. To use this design as a costume, grab a friend to dress up like his sidekick Vincent Vega in the UC Santa Cruz shirt above. In addition to the Jules' Blue Krazy Kat Cartoon tee above, browse the Pulp Fiction Clothing Gallery for more apparel like men's and women's clothes, kids shirts or hoodies.